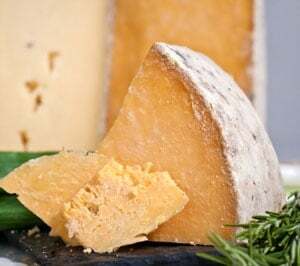 Cheese has long been a staple of the Swiss diet—a fact that is hardly surprising in a nation where, until recent times, dairy cows outnumbered people. Our second selection this month hails from the central cantons of Switzerland. The etymology of the word Emmentaler provides a clue to its origin: Emme is the name of a river in Switzerland and Tal means valley. The Emmentaler valley is probably the best-known valley in Switzerland, and its residents are considered to be hard working, thoughtful, and independent. Sources trace Emmentaler back to the early 1500s, when making Emmentaler was a way to preserve the milk produced by the significant herds of cows. The technique spread, and ultimately almost all the Alpine nations developed a regional Emmentaler. Given that it takes one-and-a-half tons of milk to make one 220-pound wheel of Emmentaler, one wonders how long it has been since making Emmentaler was primarily a way of saving milk. Certainly times have changed, and today Emmentaler is widely produced because it's widely traded. The cheese provides a window into the ingenuity and willpower of the Swiss. Faced with a huge demand for their cheese, they could have easily consolidated operations, built huge factories, and churned out the giant wheels at a quick clip. They didn't. Instead, Swiss cheese is made in over 1,500 small dairies lining the Emme valley. Each dairy makes a small number of strictly controlled, raw milk cheese wheels under the watchful eye of the all-important Swiss Cheese Association. This system allows for more careful, hands-on cheesemaking with higher overall quality. With the high prices of fuel, the Swiss Cheese Association thought it made more sense to move the milk short distances to make the cheese, then truck the wheels (which makes a lot of sense when you consider the volume of milk required to produce each wheel). The fact that the Swiss built an organization around these two principles—artisan-quality cheesemaking and finely honed economics—is anecdotal evidence that you actually can have it all! What’s with the Holes in the Cheese? The characteristic holes of Emmentaler cheese are formed during the maturing process in the fermentation cellar. 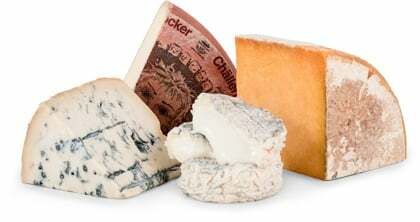 The heat in the fermentation cellar causes propionic acid to ferment, leading to the production of a carbon dioxide gas byproduct that forms within the body of the cheese. As the cheese rind becomes harder and harder with age, it forms a natural barrier, preventing the gas from escaping outwards. As a result, the gas accumulates in various places in the body of the cheese, displacing an equal volume of the body of the cheese and leaving the famed holes in Swiss cheese. You may have noted that the holes in Swiss cheese vary in number, size, and their distribution patterns. If they are particularly regular and round in shape, they are called "eyes." While there are some kinds of cheese with a body that should be as "closed" as possible (e.g., have a few small holes) there are others in which these holes are essential. The latter is definitely the case with Emmentaler cheese, in which the formation of the holes speaks to the type and quality. Emmentaler is characterized by nearly walnut-sized holes. It is considered to be one of the most difficult cheeses to produce because of the complicated hole-forming fermentation process. Authentic Swiss cheese is never harsh or bitter, but should present a degree of acidity on the finish. As you will notice with each piece of Antique Emmentaler, the smoothness is quite pronounced. Its normal intense, sweet nuttiness has mellowed, leaving a long and increasing feeling of warmth in your mouth. Your Emmentaler is over a year old, while most Emmentaler on the American market has been aged less than six months. Enjoy!